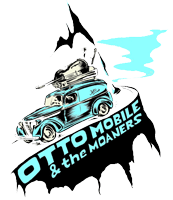 Otto & the Moaners is the original ramblin’ country blues project of big-lunged, “folkslinger” Matt Lundquist. The band is ever shifting between a down-to-the-root acoustic outfit and a wild hearted electric caravan. With a voice seasoned by a thousand campfires, Lundquist sings for the freedom of every soul in this great land. His prodigious song catalogue was forged along lost roads and in national forests. The songs are then layered with West Coast wanderlust and Deep Country dreams. His band delivers the songs with Waylon stomps and Stonesy struts while Lundquist fingerpicks a slide guitar like a spring creek sings. Lundquist started the band in Oakland, CA with the 2008 album ‘The Lost Songs of Otto Mobile’ – a folk rock tribute to his Great Uncle Otto. Then, he spent a decade rollicking around the Bay Area, learning the pedal steel, and soaking up the sounds. In 2012 he released ‘Restless Sun’ – a collaboration with Elliott Peck and Connor O’Sullivan. Presently, Lundquist is living out in the rolling countrysides of Bloomington, IN where he is writing songs, woodshedding the steel, throwing down with friendly bands and living the good life.